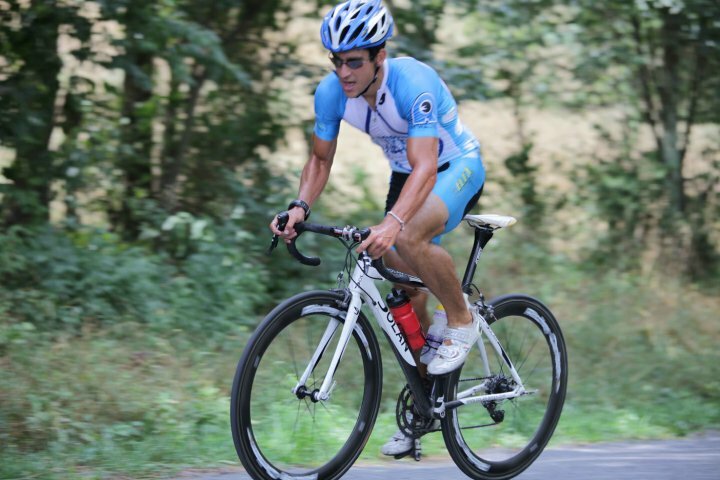 EPIC EPIC day for Matias, who finished 8th overall in the Eagleman half-iron triathlon, beating half of a very strong PRO field (not to mention top amateur by far), including 2010 champ Terenzo Bozzone, with a very strong bike and a 1:18 half-marathon run. 4:05 time in pretty miserably hot/humid conditions. Crushed it. mIGHTY MATiaS you are my new hero. Did you use a heart rate monitor? New hero? What about Mike Wardian and Chuck Moeser, those mighty warriors of the roads about whom you wax poetic? Has Mighty Matias replaced them in your hierarchy of heroes? Or is this the dawning of a new age in which a triumvirate of mighty heroes is extolled? I'm mighty interested to know. This is so impressive. Matias is an unbelievable racer and an incredibly talented triathlete (much more than he gives himself credit for). Especially on the half IM, it is generally impossible for a non-fulltime pro to compete with pros, let alone beating someone like Bozzone, who was world champion at this very distance in 2008. Go and compete for Chile and do ITU races ASAP. You have by far the best chances of competing in big international races and the Olympics of any of us. I can only hope to ever reach your level at tri's. What's the next race? Thanks for the insight Dirk. It sounds like this was an amazing performance and something many of us "simpleton" runners might not understand. In all seriousness Matias, just quit your day job and move West for a year. Go to Colorado or Flagstaff and train in the vastness of that great land. Then go and win all of the big races. What the heck. You go around once and you are only young and free for a brief period. And I can write some article called "working man from Gaithersburg Meets Max Lockwood and becomes inspired to become world champ triathlete"
This is an event that had consistently seen winners in the mid 3:40 range. The past couple of years, the times have crept up, with last year (a particularly hot year) being won in just a shade under 4 hours. This year, the winner was victorious because he put down a 56 mile bike split in 2:03 (27 and change mph). From year to year, there are a ton of factors that can lead to slower (or faster) times: inaccurate swim course (long or short), current in the river, temperature (wetsuits were not allowed because the water was too warm), wind on the bike, excessively warm air temperature, humidity. But the one thing that's for sure, is that the conditions are the same for all athletes - if anything, a little worse for age groupers because we in the 30-34 AG started one hour and five minutes after the pro wave. This time of year, that can account for a few degrees warmer the entire day. Matias won the amateur title by 4 minutes. Only 7 professionals were ahead of him, meaning he beat 8 (another 5 DNF'd). He had the third fastest run of the day, and the margin wasn't even that big - Richie Cunningham, one of the fastest in the world at the half iron run distance, was just 90 seconds faster. Most of the other pros were not faster than 1:20. Between his 2nd place finish at Columbia a few weeks ago and now the win at Eagleman, I second the "let's see what this guy can do" idea. Some smart sponsor(s) should pick him up and allow him to do what he does for a while. I say this also selfishly as with him out of my age group, it gives the rest of us a fighting chance (gap to 2nd place in age group was nearly 5 minutes over a guy who had over 4 minutes on Matias off the bike). But seriously, this was an absolutely crushing performance, and if you would like an idea of just how hard this is, think of running 6 minute pace for a half marathon at 10:30 in the morning on hot, flat roads that offer no shade. If you can, first go swim and ride for a little while (keeping in mind Matias avg on the bike was 25mph for 56 miles). Insane. Way to go buddy. 3) I would LOVE to get off the bike and get a chance to race those studs. I think I can hang. And believing is have the battle. 1. I don't think you're far off in the swim actually. Starting in a large age group and having to zig-zag through many waves before you is not an advantag. Being able to jump on the right feet will put you right in there. 2. The bike is where the real difference is, but then again, I'd pick you over any of them while working fulltime. I have no doubt you could go 2.10 sitting at 10 meters for 56M in another year (and most certainly if you worked less). 3. no need to comment there- you'd run with the best in the world if you're close. 4. You raced in warmer weather because of the later start. The advantage of the bike is probably negated by having to compete in hotter weather.